Winter weather is a time where pests want to hide in the warmth of your home. Most folks think of rats and mice, but many other pests like ants are also prone to hiding indoors in the wintertime. Rats, mice, and squirrels love to nest in attics during the winter. They burrow through the insulation and huddle around furnaces. They can be especially annoying by scratching in the ceiling and walls, keeping you up all night. They can also turn your attic into a disaster zone by contaminating the insulation with feces and urine. It is a nasty thought to think of all the airborne contaminates floating around the attic and into the HVAC system of your home. These rodents need to keep their teeth sharp and constantly gnaw on anything to sharpen their teeth. They chew on wires and in some cases have led to house fires. Raccoons, opossums, and bats can also contaminate and destroy attics. These pests can be eliminated with proper exclusion work. Winter is a great time to ensure all entry points into the home are sealed off. Many do not realize there is a gap between the shingle line and the gutter line, the usual entry point into the home for unwanted pests. A good exterminator can seal off these areas so animals can no longer get in these gaps. Roaches and silverfish enjoy huddling in the warmth of attic insulation, and many homes see an influx of these two pests during the winter. Cockroaches also spread disease, and their droppings and saliva can trigger asthma attacks, especially in young children. 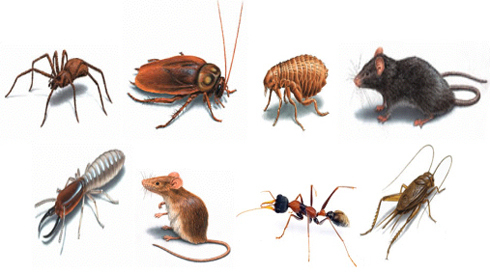 Call The Bug Dude today, and take care of these pests before they do serious damage to your health and home!